year it was good to relax, have some fun and not worry about the times. We still had to run a very hilly and muddy cross country in our outfits but it was "all about the photo". This years theme of "Despicable me" at least gave Andy, Tony and Jonny the chance to dress up as the girls and to practice their ballet skills. 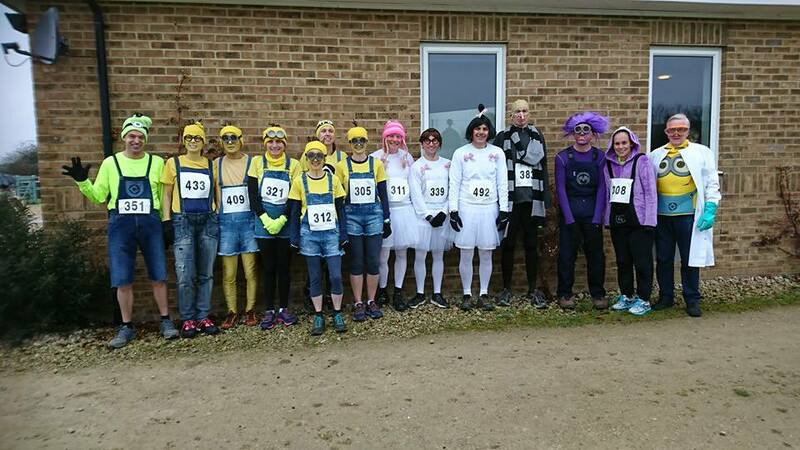 All the outfits were brilliant as usual and we came away with the most important prize of "best team fancy dress"
We were pushed hard, however, by Cherwell runners in grass skirts. But we lost the individual prize which went to a guy in a mankini and hotpants. Which I would not begrudge as it was a very cold windy day. Now down to the less important results. Well done to the top 3 finishing in second third and sixth places overall and to everyone else for just finishing.